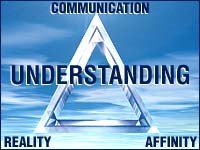 The components of understanding are Affinity, Reality and Communication. Affinity is the degree of liking or affection. Reality is agreement, or that which appears to be, and communication is the interchange of ideas or objects. Together these form an interrelated triangle. Another tool of considerable importance in Scientology, and one that greatly assists interpersonal relationships, is the principle of affinity, reality and communication. These three interdependent factors may be expressed in a triangle. The first corner of the triangle is affinity, which is the degree of liking or affection or lack of it. It is the feeling of love or liking for something or someone. The second corner of the ARC triangle is called reality, which could be defined as that which appears to be. Reality is fundamentally agreement. What we agree to be real is real. The third corner of the triangle is communication, defined as the interchange of ideas or objects between two people. In human relationships this is more important than the other two corners of the triangle. The interrelationship of the triangle becomes apparent at once when one asks, Have you ever tried to talk to an angry man? Without a high degree of liking and without some basis of agreement there is no communication. Without communication and some basis of emotional response there can be no reality. Without some basis for agreement and communication there can be no affinity. Thus these three things form a triangle. Unless there are two corners of a triangle, there cannot be a third corner. Desiring any corner of the triangle, one must include the other two.